Note: This plugin is the addon for WPBakery Page Builder (formerly Visual Composer), it requires WPBakery Page Builder to be installed and activated on your site. Some of the 3D CSS3 transition features are only available in modern browser like Chrome, Firefox, Safari, Opera or IE10+. The HotSpot element need the frontend editor enabled to drag to update the icon’s position. Help you to add a Google Material style auto delay slider easily. Optional avatar, avatar support icon or image, icon with WPBakery Page Builder built-in Icon Picker. You can customize each hotspot icon’s postion easily in the WPBakery Page Builder Frontend editor. 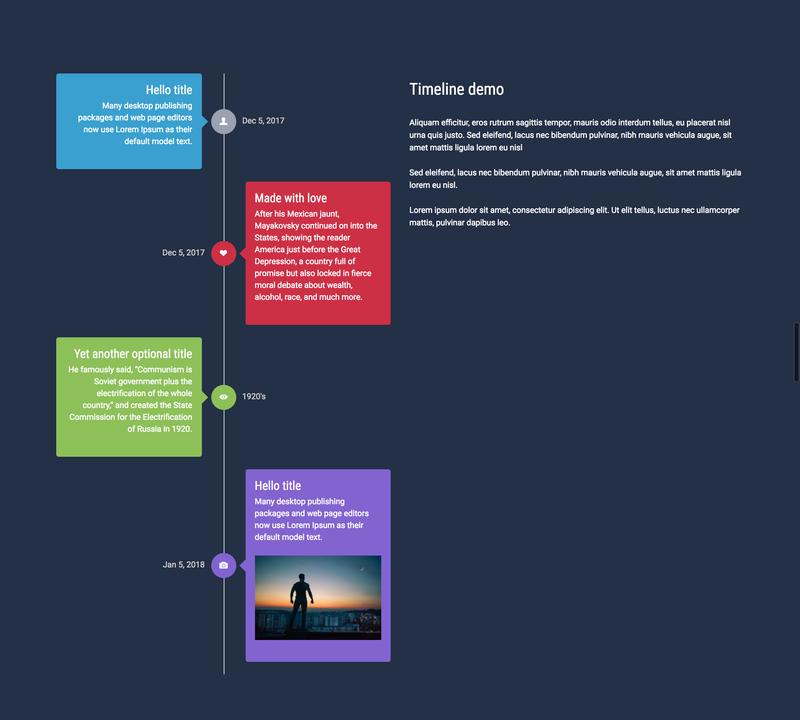 Included Depth Modal, Profile Card, Fluidbox, Ribbon, Animate Button 01 etc, which are all in simple design, and help you to add an eye catching effect to your site. - Improvement: some other small improvement. - New: Card Slider, responsive card slider support auto delay slideshow. - New: Side by Side V2, add 2 side by side card, support auto delay slideshow. - New: User Profile, support social media icon with auto delay popup. - Improvement: add alt attribute to most of the image element in the addon. - New: Data Table, add responsive information data table. 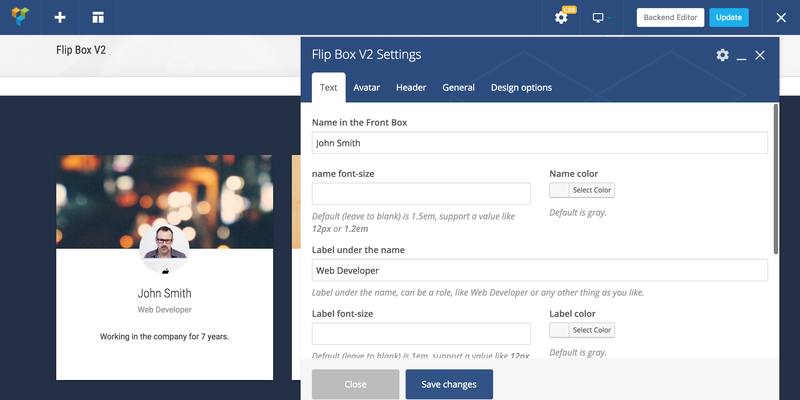 - New: Float Block, add fixed button with popup content. - New: Profile Card V2, help you add a card with animation buttons. - New: Image Compare, help you add two compare images side by side with caption and buttons. - New: Hover Card V2, add auto delay Hover Card, give user more flexibility in the content, avatar, text and social media icon etc. 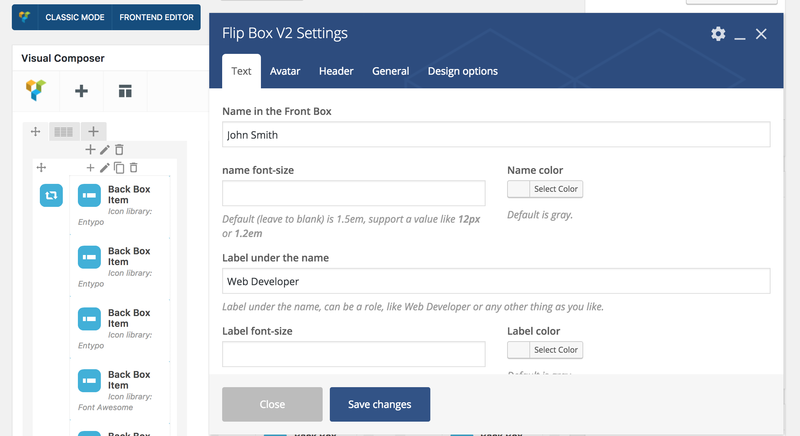 - New: Flip Box V2, another new version of exist add-on, with more options in the back box, you can add item individually for the back box. - Fixed: link not working in the Parallax element. 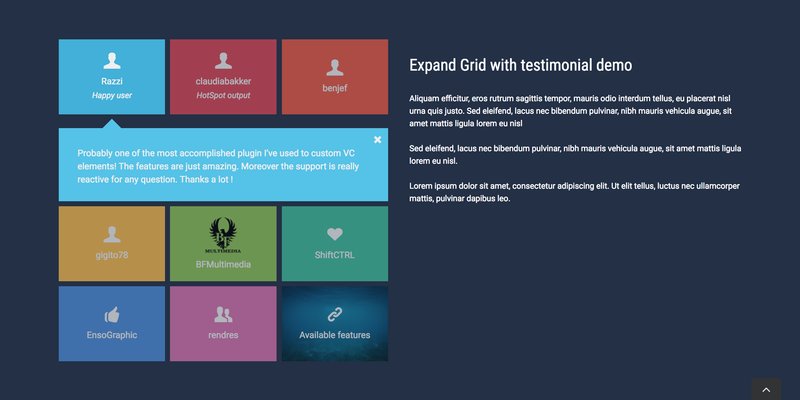 - New: Expand Grid, help you add responsive and expandable grid, support image and icon. - Improvement: add prettyPhoto lightbox for the Carousel & Gallery element. - Improvement: add autoplay option for the video in the Video Cover element. - Fixed: Home Slider not showing in last update. - Improvement: add new style option for the Profile Panel, now you can display avatar and title on the header image, and text beside the avatar. - Some other small fix. - Fixed: layout before all images are loaded option not working properly(images stacked) in Masonry Gallery. - Improvement: add display all tooltips by default option for HotSpot element. - Other: remove blank [accordiondesc] in Image Accordion, update icon font size from 48px to 32 px in Profile Panel. - Improvement: Add arrow size option, element shape option to the Image with Arrow element. Make the text align center in the element. - Improvement: update the tooltipster tooltip js file in App Mockup, Stack Gallery, Side by Side to the minified one. - Add Icon Picker for the Sticker, Cube Box, Side by Side, Separator, Material Card (available after WPBakery Page Builder version 4.4), now you can add icon more intuitively. Note, you may have to re-add the icon in some element due to the code change, other data will be safe. 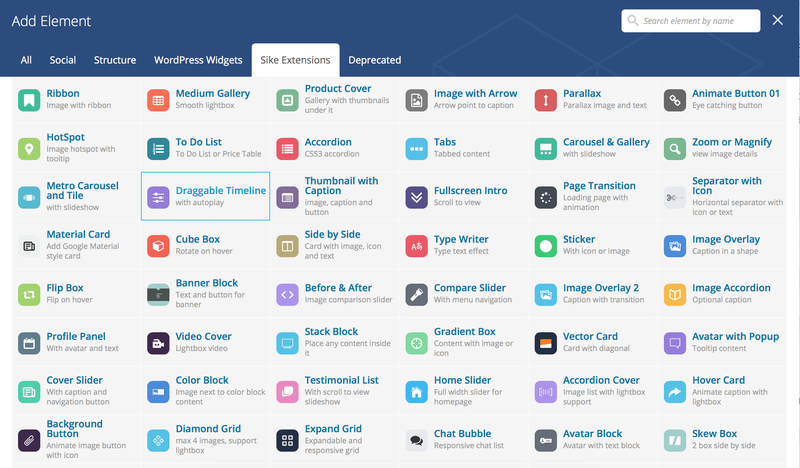 - Icon Library (for the Icon Picker) included: Font Awesome, Open Iconic, Typicons, Entypo, and Linecons. So there are more icon options after this update. - Introduce new element: Image Overlay (include Icon Picker too). - Fix some compatibility with VC 4.4. - Add new display option to the Scroll Notification, now you can choose to display the notification by default, hidden when user scrolling. Fix the auto delay second in the setting too. - Increase the z-index of the lightbox, now it will overlay the menu in most of the themes. - Update the DA Gallery, compatible with VC 4.3. - Add pulse animation, hotspot circle dot color option for the hotspot icon in the Image Hotspot add-on. - Update Font Awesome to 4.2 - Fix some typo error. - Update the add-on icon in the admin area, add description for each add-on. - Update the icon in the backend editor, add description for each add-on. - Add a container width option in the iHover backend, help you to control the thumbnails position in the column. - Fix the layout number does not work in Medium Gallery. You can overwrite the vc-extensions-cqbundle.php, mediumgallery/vc-extensions-mediumgallery.php and mediumgallery/js/init.min.js files only to get this update. 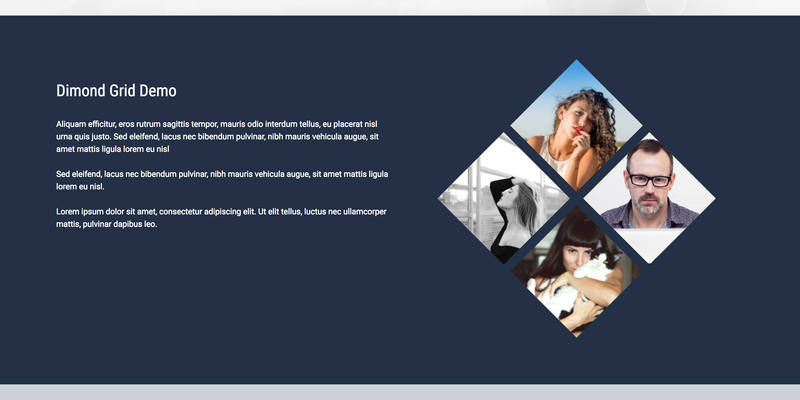 - Add a responsive and retina Medium Gallery and Ribbon extension. - Add Figure Navigation extension, you can use it as a price table. - Add Animate Text extension, you can use it as notification label. - Make it compatible with WPBakery Page Builder which is installed within a theme, it'll work directly after activating. You do not have to copy the line of code anymore.